Earlier this year, I prepared a literature review on changes in musical taste for a study commissioned by the San Francisco Symphony so the ephemeral subject of how musical tastes develop, shift, morph (choose a verb) is a little higher on my radar than usual. 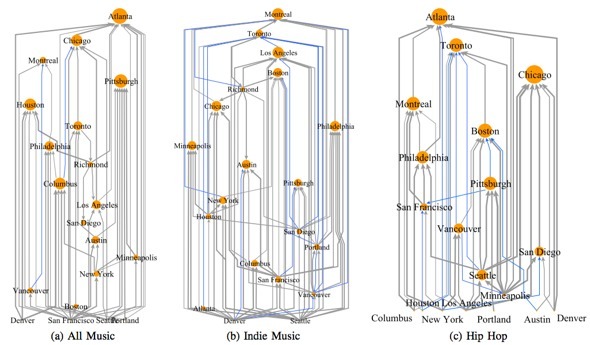 Discover Magazine recently published a quick summary of a research paper that maps the geographic flow of music on the social-networking music site Last.fm. There’s more to it than this but the researchers found that among American Last.fm users, Atlanta is the trendsetting city. There are some quibbles I have with how grand a conclusion you can make based on info. gathered from a single social media site but it’s interesting and they created some cool info graphics so I’d recommend checking it out: Which City Is the Musical Tastemaker for the US? Hint: Not NY or LA.